John Bernard of Let Them Fight has drawn my attention to an extraordinary comment appended to his post this week featuring the views of Ben Shaw, a combat veteran and embedded reporter in Afghanistan. Having featured John's post of the original Ben Shaw material, I am passing along the new comment. It is also by Ben Shaw. It is a retraction and apology for his initial observations, criticisms, and opinions, and it is extraordinary for its abject and sweeping aspect. Too Big To ... Be a Conspiracy? 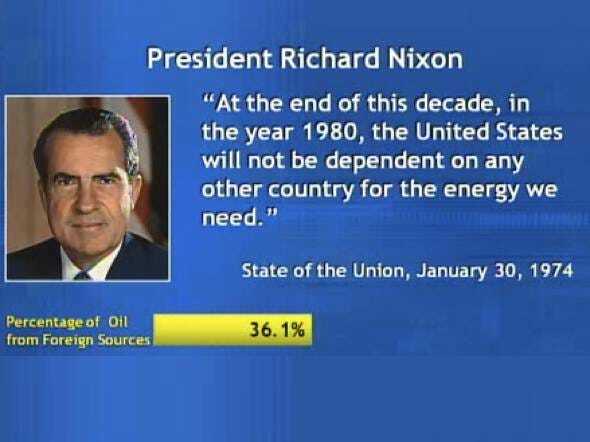 From the Milken Institute via Business Insider: a presidential pattern, from Nixon to Obama, of what are euphemistically known as "broken promises" about ending US dependence on foreign oil. Ah, Yale. So edifying, so enriching (at least metaphorically speaking since the Yale experience drains parental coffers of as much as $50K per year). I just dipped into Ye Olde Daily News to learn about the quaint (new) custom of "Spring Fling" -- a rock extravaganza -- on the Old Campus, the organization of which requires the students of the college social committee to have spent much of the past two semesters studying hundreds of bands to determine which of them should be invited to come and perform this week on the Old Campus. 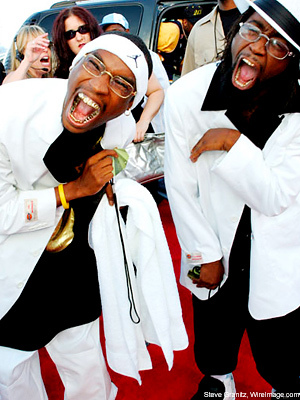 The poor dears must have burned up their I-pod ear buds in pursuit of the Truth and Light -- and Good Taste -- that led to the selection of, yes, the Ying Yang Twins as one of the acts. This is an ultra-raunchy hip hop group most often described as "misogynistic." Corroboration is a tool we all seek in determining validity. What follows shortly is a first-hand accounting of the cost of the failed policies of this administration and the last in Afghanistan. I want to give full credit to Herschel Smith at 'The Captain's Journal' for bringing this to light. The contacts he has fostered have led to this piece which I believe to be of particular significance and pivotal to the discussion. 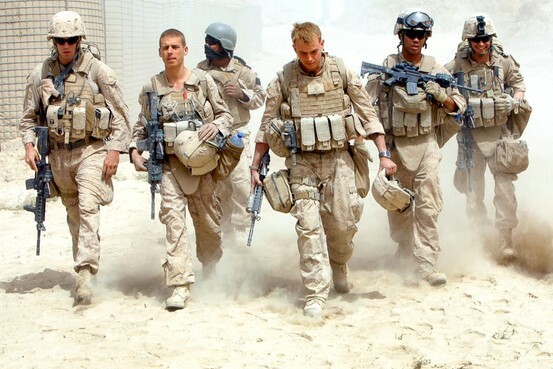 For the past several months I have been making the case, in this Blog, for my fellow Warriors - especially for the actively employed but also the retired, that the current strategy in Afghanistan is doomed to failure. Doomed because the assessment of the enemy, the local government and civilian population has been skewed by wrong - if any, historical analysis. We are also back in the cycle of the socialist world view which precludes specific national interests and imperils our Warriors, a national asset, for the purposes of rebuilding a foreign nation. The lives of our Warriors have been trumped by the lives of a civilian population that has no understanding of the freedoms we now perilously take for granted. Because the concept of personal freedom is anathema to the Koranic principles the Afghans willingly apply to their lives, families and culture, they lack any motivation to fight for freedom or any change. Because they will not fight for it; they do not deserve it. 'They who can give up essential liberty to obtain a little temporary safety, deserve neither liberty nor safety.' Benjamin Franklin. 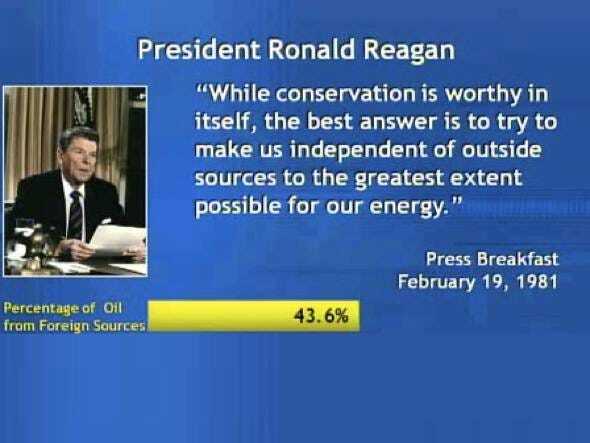 In essence, we are wasting the lives of our precious national resource; our Sons and Daughters for the purposes of freedom for those who neither understand it, nor want it and who are not covered by the oaths sworn by our Warriors. The creators of South Park, Trey Parker and Matt Stone, get it. They get the free-speech significance of the Danish Muhammad cartoons epitomized by Kurt Westergaard's bomb-head Muhammad. They even get it across. "It's so sad, the whole Muhammad, the whole Danish cartoon thing," said Stone, Parker seated beside him during a joint interview with the entertainment website Boing Boing. Newsflash: " `Muhammad' now a dirty word." So reports the Hollywood Reporter today in a story about Comedy Central's decision to bleep all references to Mohammed in this week's episode of "South Park," a follow-up to last's week's episode spoofing the criticism-proof Islamic prophet. That's criticism-proof according to Islamic law (sharia), of course, which Westerners have supinely submitted to. At Family Security Matters this week, Ruth King of Ruthfully Yours has interviewed me about Petraeus's Israel Problem, the Conservatives' Petraeus Problem, and more. Cartoon: Mohammed is the one in the bear suit. Have been meaning to post about a sicko Islamic death threat video about "South Park" founders Matt Stone and Trey Parker, with Ayaan Hirsi Ali, Theo van Gogh, Salman Rushdie, Geert Wilders, Kurt Westergaard and Lars Vilks rounding out the cast of those similarly targeted for "offending" Islam, even as I have been simultaneously monitoring the reluctance (read: fear) of the MSM to report the story, period. Imagine: Mega-star animators Stone & Parker are threatened with death by jihadists for their "South Park" cartoon satirizing Mohammed for being off limits to mockery (to the point, in the cartoon, where both redheads or "gingers" and celebrities all want some of what he's got), and the MSM, most of it, wants to pretend nothing is happening. This week's syndicated column isn't about Islam, war, or the tragic emptiness of conservatism today. In fact, it's kind of a writing-trip homeward, back to the kind of pre 9/11-subjects I used to follow more closely. Just as the Pulitzer Prizes come around every year, a conservative columnist comes around after them, dusting off the hard fact, as measured in an ever-expanding set of tally marks, that conservatives rarely get to pop a champagne cork over one of their own. "Development or Die" vs. "Submit or Die": Who Wins? I really feel for Captain Mark Moretti, above, holding hands with this Pashtun tribal primitive -- men holding hands being a "custom" among "friends" in the region, according to the accompanying Washington Post story. These two men, infidel and jihadist, are not "friends" by any stretch. Moretti was photographed carrying out the distressing mission of arranging a truce for the US retreat from the Korengal Valley, accomplished this week. 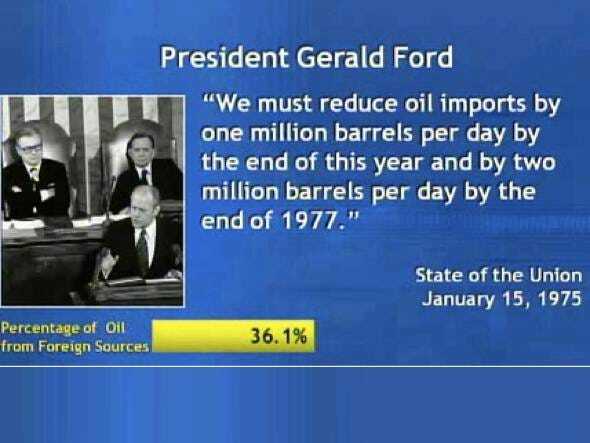 The deal he put to the "tribal elders" was this: If we (US) can leave this (pointless) outpost without jihadist attack, we won't destroy the 6,000 gal. of fuel we still have inside our about-to-be-abandoned base. Or, to put it another way, we'll pay you 6,000 gal. of fuel to retreat without incident. And I'll hold your hand if I must. LTC Terry Lakin is laying it all on the line -- freedom, family, pension, career -- in refusing all military orders including deployment orders for his second tour of duty to Afghanistan pending release of the president's original 1961 birth certificate attesting to his constitutional legitimacy as a natural born citizen and thus commander-in-chief. On Monday, the 18-year veteran and decorated medical officer had his Pentagon access pass and laptop revoked, was read his Miranda Rights by his commanding officer, and informed that he would face a court martial. "Official White House photo by Pete Sousa"
I like the screamer better. Obama: bowing to China, shutting out the press. While the military "goes native," the media goes Soviet. This is a bad combination. The few, the proud, the Marines? cont'd. 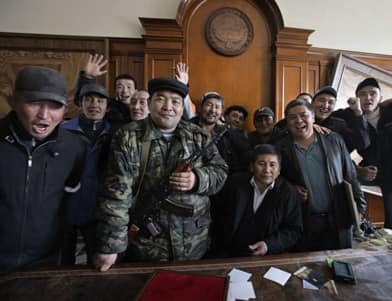 AP Photo: Protestors in the Kyrgyz cabinet room after seizing the government last Thursday. Remember that flash of headlines that whizzed by last week about rioting, revolt, civil war, whatever in one of those Islamic , consonant-jammed, '-Stans near Afghanistan? That would be Kyrgyzstan, whose US base in Manas is the premier hub for US and NATO troops transiting in and out of Afghanistan. I gather flights in and out have been touch and (not) go since the capital was seized by factions opposed to the US bases, sending friendlyish President Bakiyev into hiding. Diana, I read the article (above) a couple of times and all it says is "Arriving in a cavalcade of trucks and armored vehicles, three Afghan soldiers pinned down a sheep and held a blade to its throat in a traditional Afghan gesture seeking clemency. Then an elder summoned them inside and McRaven offered his condolences." In other words, what really happened to the sheep? 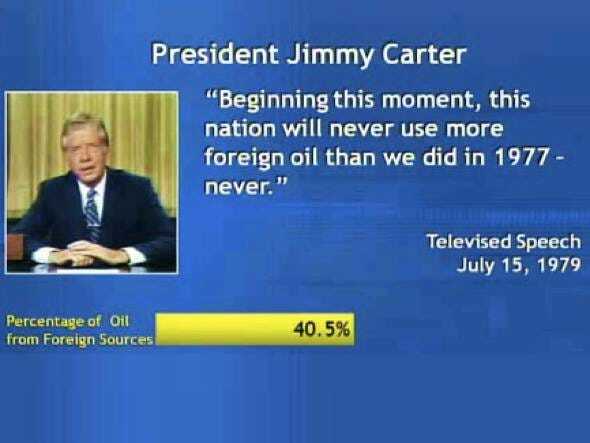 And was the US military actually involved? How high is Libya's Gaddafi riding? How low are the EU and the US grovelling? And how did Switzerland ever become what I have to describe (below) as the new Israel -- the new fountainhead of "Arab anger"? Paul Belien has the jaw-dropping details. March was a good month for Libyan dictator Muammar Gaddafi. 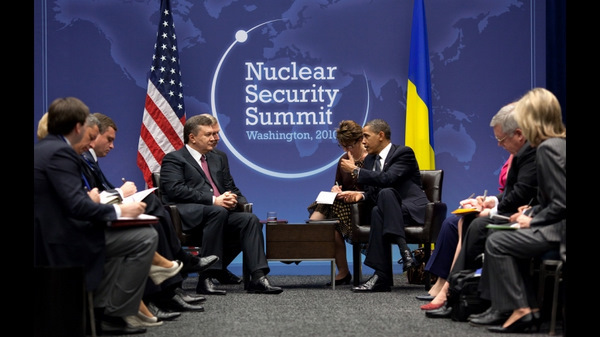 He received high-profile apologies from both the United States and the European Union. The apologies were at the expense of Switzerland, the country against which Gaddafi has officially declared “holy war.” Switzerland has a tradition of neutralism in international conflicts, but could not avoid a nasty conflict with Libya. Trying to remain “neutral” in the Swiss-Libyan conflict, the US and the EU grovel before the Libyan despot. Photo: Maj. Jim Gant, proponent of "going native," with the Pashtun tribal chief he dubbed ... "Sitting Bull." A reader e-mailed me to comment on a column by David Ignatius, who recently accompanied the chairman of the Joint Chiefs of Staff, Adm. Mike Mullen, to a shura, or local council meeting, in Marja, Afghanistan. Ignatius wrote: "Given the weakness of the central government in Kabul, U.S. commanders are working to align American power with the most basic political structures, the tribal shuras. `Culturally, this country works,' says Rear Adm. Gregory Smith, the chief military spokesman (in Afghanistan). `People sitting down together can solve almost anything.'" While we're on the subject, I think today is as good a day as any to post a letter I emailed last Wednesday to Commentary magazine's blog Contentions, where Max Boot posts amok. I had hoped for some form of a public correction attesting to my reportorial honesty, repeatedly impugned by Boot, but not having received any response to date, I will set the record straight here. Andrew C. McCarthy: "Petraeus's Israel Problem"
Max Boot is a good historian. On Islam, I often disagree with him, finding in his work the wishful thinking common among Islamic Democracy Project enthusiasts. Still, he is thoughtful and civil, so one always expects to learn something from reading him. It was therefore jarring to read his smug attempt to drum Diana West out of the conservative movement. Boot seems to see himself as William F. Buckley Jr. and West as the John Birch Society. If you’re going to play that game, you’d better be right. Boot is dead wrong. The few, the proud, the Marines? Yup, that's Lt . Col. Matt Baker (commanding officer of 1st Battalion, 3rd Marine Regiment) Sgt. Maj. Dwight D. Jones (sergeant major of 1/3), and Maj. Rudy Quiles (civil affairs team leader with 1/3), all decked out for Islamic New Year last month in Nawa, Helmand Province, Islamic Republic of Afghanistan, which, of course, is Afghanistan's official name. The official Marine Corps caption (below) tells us they are decked out in traditional Afghan ceremonial garb to "honor the occastion." Since when are dress blues not spiffy enough to honor any occasion? 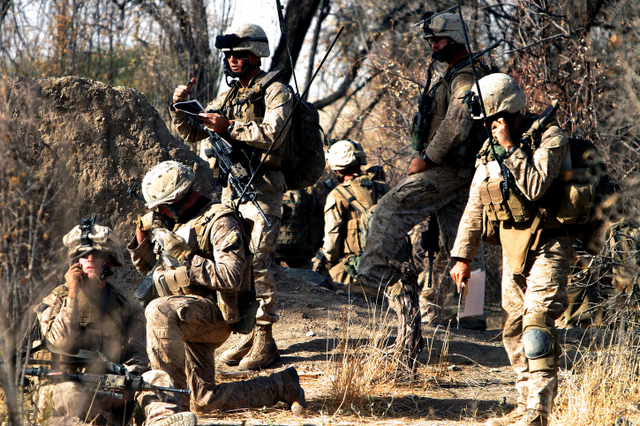 Official Marine Corps photos and captions below. 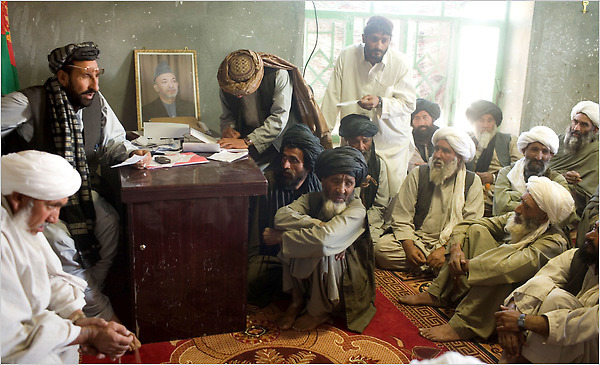 Maj. Gen. Nicholson: We've Got to Re-Evaluate Our Definition of the Word "Enemy"
NYT photo and caption: "Hajji Abdul Zahir, far left, the district governor of Marja, oversees payments by the Marines to Afghans in the region." Um, do you see any Marines? Meanwhile, informants say that 30 Taliban have received "compensation" money from Marines from one Marja outpost alone. Readers of this blog will remember Maj. Gen. Larry Nicholson, who, since last summer's Marine mini-surge into Helmand Province, has been noted here, and often, for his classic order to drink lots of tea, eat lots of goat, get to know these people. Does This Man Need a "Brain Scan"? This is a picture of LTC Terry Lakin, the highest ranking and first active duty officer to refuse to obey all orders on the basis on unanswered questions regarding President Obama's eligibility. A medical officer, Lakin has an impeccable military record (detailed here), which includes providing medical care for admirals and generals at the Pentagon where he serves as Chief of Primary Care and Flight Surgeon for the DiLorenzo TRICARE Helath Clinic, and a previous tour in Afghanistan among other overseas posts. Photo album from top left: Karzai and A-jad in Kabul last month. File photos of A-jad and Meshal, Maliki and Ajad. Nasrallah, Assad and A-jad in Damascus in February. Gates of Vienna has just posted a must-read story about Muslim thugs, mobilized by a group called sharia4belgium, shouting down Dutch-born man of letters Benno Barnard at the University of Antwerp last night in Belgium -- Belgium, which, with a unanimous panel vote in the Belgian Federal Parliament today, has just come one important step closer to becoming the first European country to ban the burqa and niqab (full-body Islamic coverings). 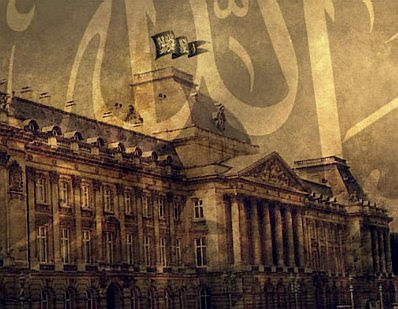 The image above is a detail from a picture on the sharia4belgium website, and shows the jihad flag of the caliphate (with the shahada) flying over the Royal Palace in Brussels. 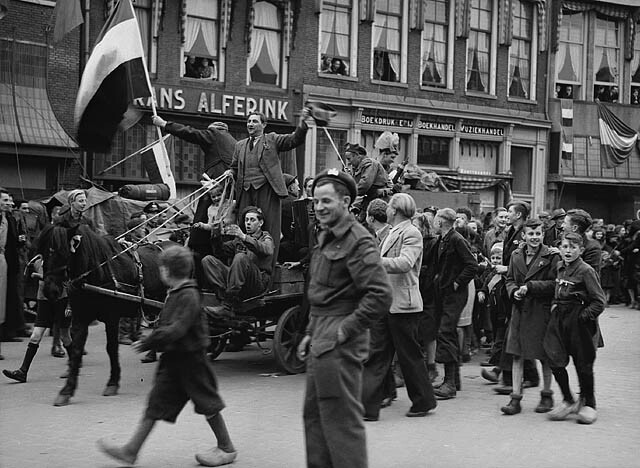 Photo: Infantrymen of the 7th Canadian Infantry Brigade liberating Zwolle, Netherlands, 14 April 1945. Grant, Donald I. (Biblioteques et Archives Canada).